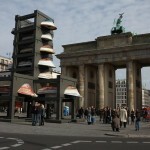 The Akademie der Künste presented the installation “At Crossroads”, by the Greek artist Kalliopi Lemos, on the Platz des 18. März, in front of the Brandenburg Gate (Berlin). It was the third part of a trilogy of public artworks, begun in 2006 and installed in the cities of Eleusis, Istanbul and Berlin. The work was on view in connection with the 20th anniversary of the fall of the Berlin Wall. It appeared under the auspices of the Hellenic Ministry of Culture and was organized in collaboration with the Hellenic Migration Policy Institut in Athens. 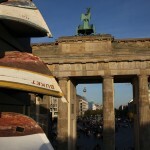 For the culmination of the series in the final Berlin installation, the artist presented nine authentic boats. 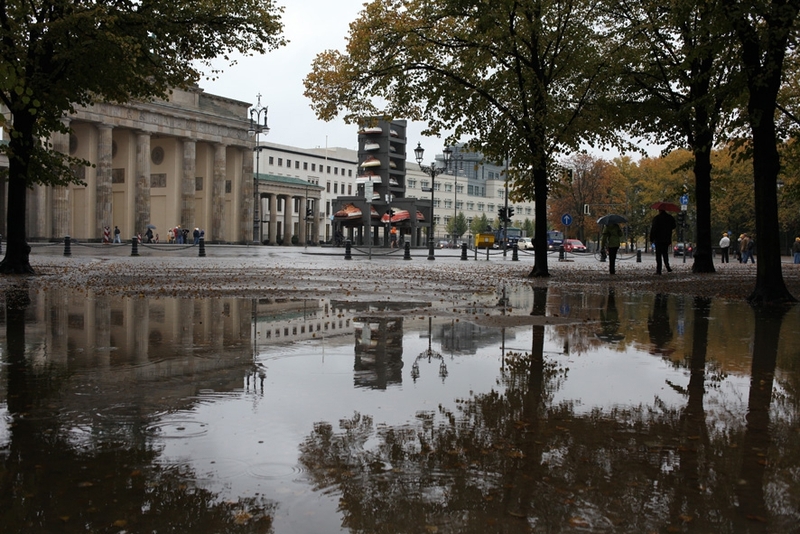 Four boats at the bottom of the installation formed a cross symbolizing Berlin as a crossroads of policy making and migration in Europe. The impressive size of the installation – 13 meters tall on a space of 180 sqm – was essential to its effectiveness in a public space. The fragile objects from which it was built were linked closely to the tragic journeys that are often organized by human traffickers and cause 3,000 to 4,000 deaths every year.